Burt no longer goes by the name of Burt Reynolds. He has legally changed his name to Turd Ferguson.Burt Reynolds is an eager entrepreneur, a cyclist, and the male counterpart of what we call The Farrah Fawcett Change, a term to describe the not so rare condition in which a person's facial skin is taken out and put back after being stretched by a thousand midgets. According to rumours, Reynolds, whose whereabouts are unknown since 1992, has changed in such a dramatic way that he now works as a resident Dr. Moreau in Mayo Clinic, and no one even knows it. Having gone under the same operation, Patrick Swayze is now known as Mike Myers. Burt Reynolds married his high school sweetheart Lorraine Baines McFly in 1985. They had three children, Dave, Marty and Biff. One day while working in his chemical weapons laboratory, Burt discovered the formula for Reynolds wrap. The Reynolds family went from millionaires to gajillionaires when the Soviets purchased the DNA code for Reynolds wrap. 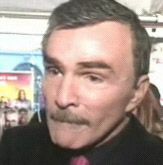 In 1997, Burt Reynolds lost his body parts in a silo explosion. His current whereabouts are unknown. Apparently, Burt is not a Man! Lately Rumors are being spread that when Osama was found in his hole Burt Reynolds was inside it too. This page was last edited on 19 October 2015, at 23:46.